These Omega-3 Fatty Acids are essential; our body does not produce them, therefore it must receive them from the food and from nutritional supplements. They are necessary for the optimal functioning of every cell in our body, mainly for the proper maintenance of the brain and heart. A deficiency of Omega-3 Fatty Acids is very typical of Western nutrition, and leads to numerous diseases, defined as diseases of the Western world. Included among these diseases are heart disease, Cerebral-Vascular Accident (stroke), and Adult Diabetes. 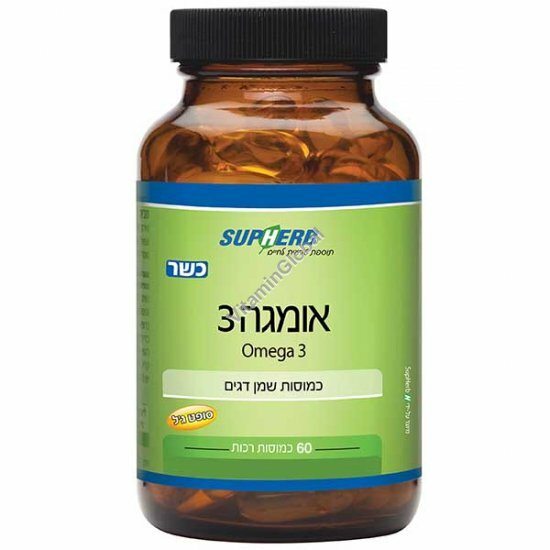 A supplementation of Omega-3 Fatty Acids softgels will prevent inflammatory processes, maintain the health of the brain, heart and blood vessels, and strengthen the immune system. Directions: 1-3 softgel day, with the meal. Available in a package of 60 softgels.